Mecca is the birthplace of Prophet Muhammad ( ). Mecca is also the holiest city in the world in Islam. The Kaaba in Mecca is the holiest site in Islam. It was built by Prophet Ibrahim (peace be upon him) and his son Ismail. Muslims around the world turn towards the Kaaba in Mecca for prayers. This is called the Qibla. We have updated information about who has access to our hacked @muslim Instagram account and are working on resolving it with the person. We will announce it here when we have access to it again. The city of Mecca and the surrounding areas are unsurpassed in its historical and religious significance to more than 1.6 billion people around the world. Mecca is the holiest city in the world in Islam. Prophet Muhammad (may the peace and blessings of Allah be upon him) was born in Mecca. The first verses of the Holy Quran were revealed to the Prophet Muhammad ( ) in a cave named Hira on Mount Al-Nur on the outskirts of Mecca. The holiest site in Islam, the Kaaba, is located in Mecca. The direction of ritual prayer, called the Qiblah, is to the Kaaba in Mecca. The holiest water in the world to Muslims is found in a well named Zamzam in Mecca. Millions of Muslims make pilgrimage to Mecca every year known as Umrah and Hajj. Mecca and Medina will be the only two cities in the world protected by rows of angels that will not let the Anti-Christ (Al-Masih Ad-Dajjal) enter. Mecca is located 45 miles east of the city of Jeddah in Saudi Arabia. The elevation of Mecca is 909 feet above sea level located in a valley surrounded by rugged mountains that range from 1,000 to almost 2.500 feet in height. The temperatures can reach above 120 degrees Fahrenheit and receives relatively little precipitation throughout the year. However, Mecca has been flooded in the past since it is located in a valley. It had a population of 1.7 million in 2008. Mecca has been called many different names throughout history. In fact, Allah (the Glorified and Exalted) has mentioned Mecca in the Holy Quran using the following names: Mecca, Bakkah, Al-Balad, Al-Qaryah, and Ummul-Qura. Mecca is home to the largest and holiest mosque in the world named Masjid Al-Haram. 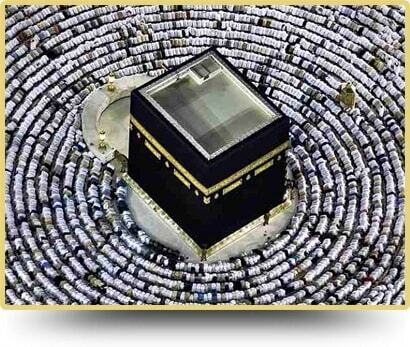 The has 160,000 yards of floor space capable of allowing up to 1.2 million people to pray at any one time. The reward granted by Allah (the Glorified and Exalted) for prayers performed at Masjid Al-Haram (Grand Mosque) is 100,000 that of any other mosque in the world with the exception of two other mosques. The first mosque is Masjid An-Nabawi (the Prophet’s Mosque) in Medina where the reward for prayers is 1,000 times that of any other mosque in the world. The second mosque is Masjid Al-Aqsa in Jerusalem where the reward for prayers are 500 that of any other mosque in the world. The Kaaba is a large stone structure constituting a single room with a marble floor that lies at the center of Masjid Al-Haram. It now stands some 60 feet high and each side is approximately 60 feet in length. The Kaaba is the focal point around which Masjid Al-Haram was built. Its four walls are covered with a black curtain called the Kiswah that reaches to the ground and is fastened to the Shadharwan with copper rings. 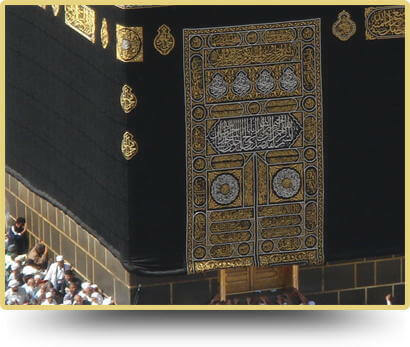 The door of the Kaaba is about seven feet from about the ground and is located at the south-east wall. There are pillars inside the Kaaba that support the roof. The interior is furnished with many gold and silver lamps. There are several bands of inscriptions on the inner walls on the Kaaba that record the many repairs that were done in the past. The Kaaba is the holy shrine dedicated to the worship of Allah (the Glorified and Exalted) built by both Prophet Abraham (peace be upon him) and Prophet Ismail (peace be upon him). There are some who believe that the founder of the Kaaba was either the Angels or Prophet Adam (peace be upon him). However, the Holy Quran provides irrefutable evidence that the founders of the Kaaba were Prophet Abraham (peace be upon him) and Prophet Ismail (peace be upon him). The Kaaba has several names. The first of these names is simply “the Kaaba” meaning a high place with respect and prestige. The second of these names is Bayt Al-Ateeq meaning the Ancient House. Bayt Al-Haram is a third name meaning the Honorable House. A fourth name of the Kaaba is Baytullah meaning the House of Allah (the Glorified and Exalted). 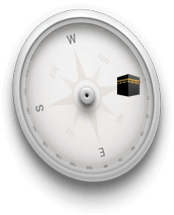 However, it is only a figure of speech and does not mean that Allah lives inside the Kaaba. The Black Stone (Al-Hajar Al-Aswad) is set in the eastern corner of the Kaaba. It was brought from Paradise and presented to Prophet Abraham (peace be upon him) by the Archangel Gabriel to be placed in the Kaaba. Prophet Muhammad ( ) had the honor of placing the Black Stone back in the Kaaba when it was rebuilt by the Quraysh. 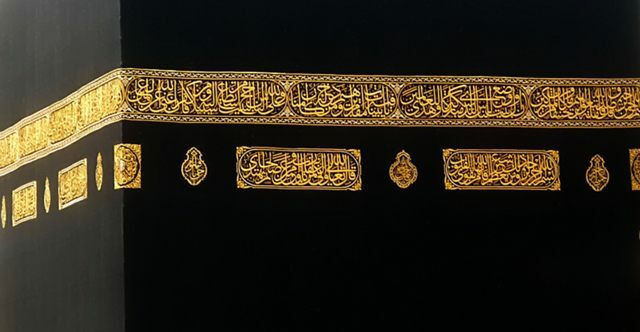 Since then it has been broken into a number of fragments and is now cemented into a silver frame in the side of the Kaaba. Its physical appearance is that of a fragmented dark rock, polished smooth by the hands of millions of pilgrims. Muslims try to kiss the Black Stone because the Prophet Muhammad ( ) used to do so. The circumambulation of the Kaaba, known as Tawaf, performed during Umrah and Hajj begins and ends at the Black Stone. The Station of Abraham (Maqam Al-Ibrahim) refers to the large stone block that was brought by Prophet Ismail (peace be upon him) to his father Prophet Abraham (peace be upon him) to stand on while building the upper walls of the Kaaba. Allah (the Glorified and Exalted) made this large stone block one which he (peace be upon him) stood soft where his footprints are visible. The large stone block measures 2×3 feet and is located in of the door of the Kaaba. The greatest virtue of the Station of Abraham is that Allah (the Glorified and Exalted) commanded Muslims to perform prayers near it after Tawaf. For centuries, the Station of Abraham was preserved in a silver box that was housed in a large domed hall. However, it was demolished in 1387 AH since it took to much space. The Station of Abraham was fixed in exquisite crystal and encased in a sturdy steel cage. The casing was then mounted on a marble platform and a dome was used to cover it that allows the footprints to clearly be seen. The Zamzam Spring (later converted into a well) holds extreme religious significance because of the miracle of its origin. It is site of a spring that, miraculously, had issued forth from a barren and desolate wadi (non perennial stream) where the Prophet Ibrahim (peace be upon him), under Allah’s command, had left his wife Hajar and their infant son Prophet Ismail (peace be upon him). In her desperate search for water, Hajar ran seven times back and forth in the scorching heat between the two hills of Safa and Marwa to provide water for Prophet Ismail (peace be upon him), who was dying of thirst. Allah (the Glorified and Exalted) sent the Angel Gabriel, who scraped the ground, causing the spring to appear. On finding the spring, and fearing that it might run out of water, Hajar enclosed it in sand and stones. The name Zamzam originates from the phrase Zomë Zomë, meaning “stop flowing”, a command repeated by Hajar during her attempt to contain the spring water. The Zamzam Well is located about twenty-one meters from the Kaaba and seven meters from Maqam Al-Ibrahim. It is hand-excavated and is about 30.5 meters deep, with an internal diameter ranging from 1.08 to 2.66 meters. Hydro geologically, the well lays within Wadi Ibrahim, which runs through Mecca, and taps groundwater from the wadi alluvium and, to a much lesser extent, the underlying fresh bedrock. The well is now housed in a basement room, protected by glass panels that allow a clear view of the well. Electric pumps are used to draw water from the well, replacing the ropes and buckets. Visitors are prohibited from entering the Zamzam Well room and surroundings. Outside this room, there was a service area, where cold Zamzam water fountains and dispensing containers were provided for drinking purposes. Recently, the Al-Haram Tawaf area has been extended to cover the entrance to this area and it is no more accessible to pilgrims. Instead, cold Zamzam water fountains and dispensing containers are now placed at the periphery of Tawaf area. The upper 13.5 meters of the well is excavated in the sandy alluvium of the Wadi Ibrahim, and the lower 17.0 meters in the underlying diorite bedrock. In between lays a 0.5 meter thick highly permeable weathered rock. Most of the alluvial section of the well is lined with stone masonry except for the uppermost 1 meter, which has a reinforced concrete collar. The weathered rock section is lined with stone and it is this section that provides the main water entry into the well. Mount Al-Nur is located on the outskirts of Mecca. It has an elevation of 2,106 feet and covers an area of 5 square kilometers. The famous Hira cave, where Prophet Muhammad ( ) had his first revelation, is located on this mountain, hence the name Al-Nur (the light) after the light of the prophet hood. Mount Thawr is located on the outskirts of Mecca. It has an elevation of 2,543 feet and covers an area of 10 square kilometers. It is home to the Thawr Cave where the Prophet Muhammad ( ) and Abu Bakr (may Allah be pleased with him) sought refuge for three days and nights from the Quraish as they left Mecca to emigrated to Medina. When they were inside, Allah (the Glorified and Exalted) sent a spider to spin a web from a bush across the entrance the entrance to the cave. Moreover, Allah (the Glorified and Exalted) also commanded two doves to fly down between the spider and the tree to make a nest and lay their eggs. Lastly, one of the qualities of the religious significance of Mecca and Medina will become most evident near the end of time. That is, Mecca and Medina will be the only two cities in the world that the Anti-Christ (Al-Masih Ad-Dajjal) will be prohibited from entering. The angels will protect all the passageways into Mecca and Medina. However, the disbelievers and hypocrites will not be able to use Mecca and Medina as a safe haven since the Anti-Christ will shake the earth three times and all of them will be drawn to him. Prophet Muhammad ( ) was born in Mecca, Saudi Arabia. Prophet Muhammad’s ( ) father (Abdullah ibn Abdul-Muttalib) died before he was born. Prophet Muhammad’s ( ) grandfather (Abdul Muttalib) raised him until he died 2 years later. Prophet Muhammad’s ( ) uncle (Abu Talib) raised him after the death of Abdul Muttalib. Abu Talib protected the Prophet ( ) until he died, approximately 42 years later. At an early age, Prophet Muhammad ( ) was known as “The Trustworthy” because of his honesty and character. Prophet Muhammad ( ) received his first divine revelation from Allah ( ) through Angel Jibreel ( ) in the Cave of Hira when he was 40 years old. The Kaaba in Mecca is the holiest place in Islam. It was built by Prophet Ibrahim (peace be upon him) and his son Ismail. Muslims around the world turn towards the Kaaba in Mecca for prayers. This is called called the Qibla. The Farewell Sermon of the Prophet Muhammad ( ) was delivered on the ninth day of Dhul-Hijjah of the tenth year of Al-Hijra. After completing his first and only hajj, he ( ), delivered the Final Sermon to a crowd numbering over a hundred thousand in the Uranah Valley of Mount Arafat. O People, lend me an attentive ear, for I know not whether after this year that I shall ever be amongst you again. Therefore, listen to what I am about to say to you very carefully and take these words to those who could not be present here today. O People, just as you regard this month, this day, and this city as sacred, so regard the life and property of every Muslim as a sacred trust. Return those goods entrusted to you to their rightful owners. Hurt no one so no one may hurt you. Remember that you will indeed meet your Lord, and that he will indeed reckon your deeds. Allah has forbidden you to take usury (interest). Therefore, all interest obligations shall henceforth be waived. Your capital, however, is yours to keep. You will neither inflict nor suffer inequity. Allah has judged that there shall be no interest and that all the interest due to Abbas ibn Abd’al Muttalib (the prophet’s uncle) shall henceforth be waived. O People, it is true that you have certain rights with regard to your women, but they also have rights over you. Remember that you have taken them as your wives only under Allah’s trust and with his permission. If they abide by your rights, then to them belongs the right to be fed and clothed in kindness. Do treat your women well and be kind to them for they are your partners and committed helpers. It is your right that they do not make friends with anyone whom you do not approve, as well as never to be unchaste. O People, listen to me in earnest, worship Allah, say your five daily prayers, fast during the month of Ramadan, and give your wealth in Zakat. Perform Hajj if you can afford to. All mankind is from Adam and Eve, an Arab has no superiority over a non-Arab nor a non-Arab has any superiority over an Arab; also a white has no superiority over a black and a black has no superiority over a white, except by piety (taqwa) and good actions. Learn that every Muslim is a brother to every other Muslim, and that the Muslims constitute one brotherhood. Nothing shall be legitimate to a Muslim that belongs to a fellow Muslim unless it is given freely and willingly. Do not, therefore, do injustice to yourselves. O People, no prophet or apostle will come after me, and no new faith will be born. Reason well, therefore, O People, and understand words that I convey to you. I leave behind me two things, the Quran and my example (the Sunnah) and if you follow these two then you will never go astray. All those who listen to me shall pass on my words to others and those to others again; and may the last ones understand my words better than those who listen to me directly. Be my witness, O Allah, that I have conveyed your message to the people. 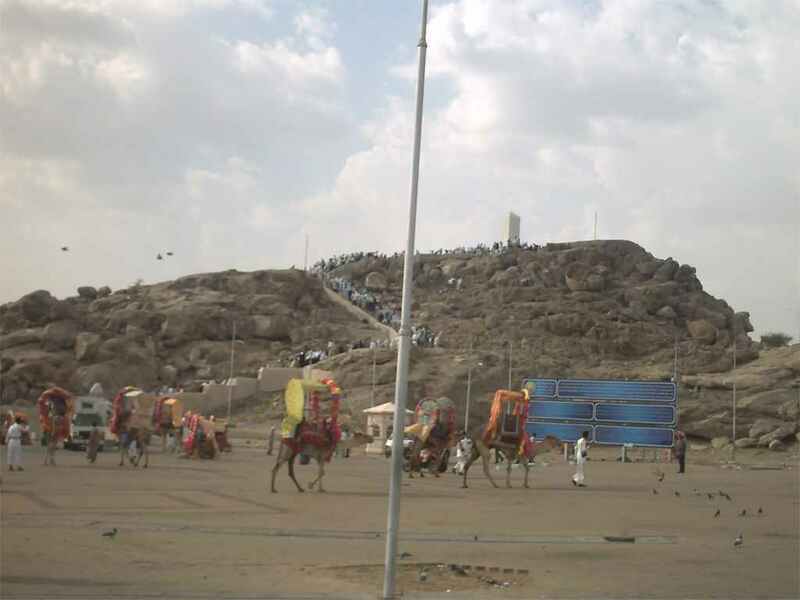 Mount Arafat is where the Farewell Sermon was given. Your using a old browser that does not support HTML5 video. The first day of Ramadan (first day of fasting) was on May 27, 2017. The first day of Eid al-Fitr was on June 25, 2017. The first day of Hajj was on August 30, 2017. Day of Arafah was on August 31, 2017. The first day of Eid al-Adha was on September 1, 2017. September 21, 2017 was the first day of the new Islamic year (Hijri year). The name of the first month in the Islamic calendar is Muharram. Prophet Muhammad ( ) migrated from Mecca to Madinah in the year 622 CE. This migration is called the Hijrah. The Hijrah also marks the start of the Islamic calendar.